As a Wrigley Institute Summer Fellow, I did a lot of diving this summer, studying the trophic dynamics of seagrass communities at Catalina Island. Diving all day is a lot of work. Rolling around in luxurious green eelgrass and counting fish seems like fun and all, but it can be long and cold at times. Below, I measure eelgrass samples from a caging experiment. The cages are designed to block fish predators such as juvenile kelp bass and rock wrasse, from accessing the 1-meter squared plots. I am hoping to see if the presence or absence of these fish predators has an effect on the eelgrass health. Russell, assembling cages to exclude predators such as the kelp bass and rock wrasse pictured above. The picture below shows some small red fuzzy algae growing on an eelgrass blade. This algae can also block sunlight from reaching the eelgrass when they grow in large amounts. 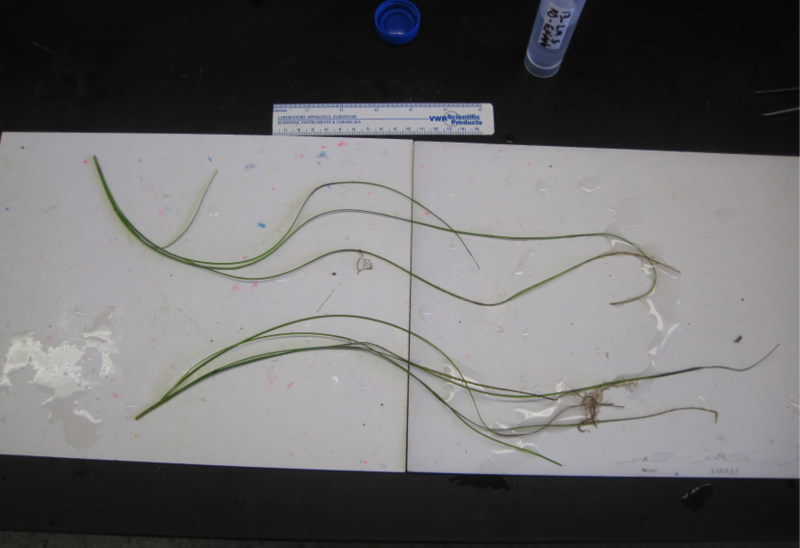 Below you can see the drastic difference when algae smother eelgrass beds. This is the same site on Catalina, before and after – even with little to no terrestrial nutrient input, algal blooms can occur. But all of our mainland estuaries are heavily developed, with high levels of nutrients being added from landscaping and agriculture. This causes plankton blooms, which make water greener and less light can reach eelgrass. You can clearly see now how with all these factors, it is possible that 90% of historic levels of eelgrass in southern California is gone! So this story may seem grim, but what can we do about it? I suggest being a smarter boater and voter. If you own a boat and love beautiful Catalina or catching tasty kelp bass, you should like eelgrass! One yacht owner told me that I should rip up the eelgrass because it takes over their sand for anchoring. But that is a good thing! Eelgrass and algal beds are economically valued at $20,000 per hectare per year: 4x higher than coral reefs! So if you are anchoring in one of the many nice coves that have eelgrass on the front-side of Catalina Island (Ripper’s Cove, Little and Big Geiger, Emerald Bay and White Cove) look first and make sure you anchor in sand. Also educate other boaters if possible. And if you live in a coastal town back on the mainland, vote against harmful development and dredging. Russell is a graduate student from Cal State Northridge working with Dr. Mark Steele. 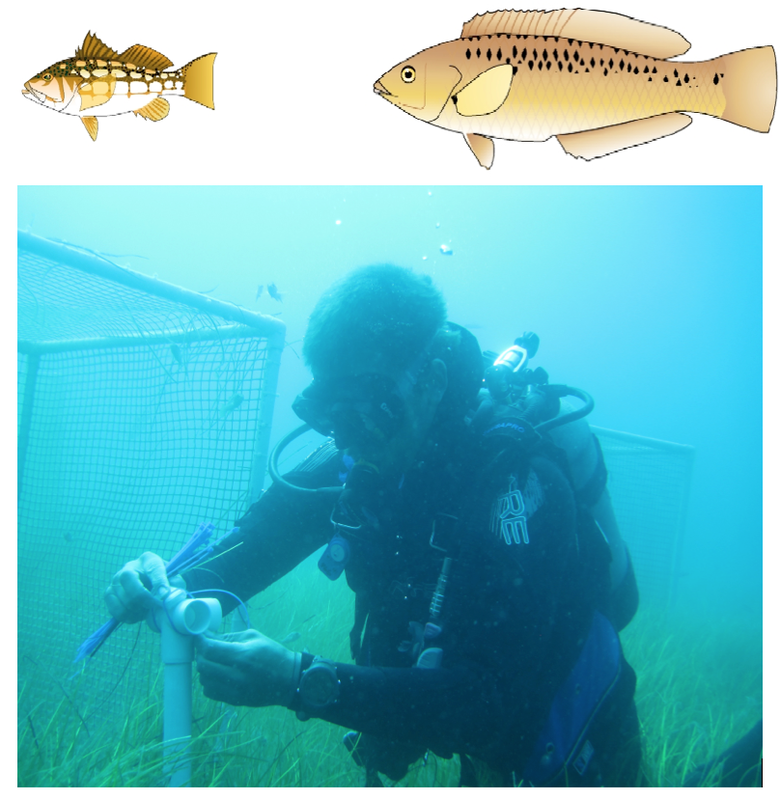 His summer project at Catalina addressed ‘The effect of herbivores versus micro-carnivorous fishes on the trophic dynamics of seagrass communities’. This entry was posted in Wrigley Institute on September 23, 2016 by Jessica Dutton. With the summer coming to a close, my time as a Wrigley Fellow for summer 2016 has also come to a close. My work is not entirely done yet, of course. And then of course, there is the slower and less interesting side of science, where I run analyses on all the samples I collected this summer and turn the completed pile of data into something that could be published by a scientific journal. And as much as I would like to do all of that work on Catalina, that’s just not possible if I want to keep taking classes on the mainland. I’ll talk more about the scientific work I did later, but the title of this blog is “A Day in the Life”, and a summary of experiments doesn’t really convey the experience of working at the Wrigley Institute. The personal details are missing, and those deserve a place too. Several of the grad students, including myself, started the habit of going for a morning swim before breakfast. This was nice exercise, and regular swimming meant that we could put off showering for days and not smell too bad, but the real benefit to dawn swimming is that all of the nocturnal creatures are still out. Night snorkeling is frequently amazing, because all the Moray eels and rock lobsters hiding in their holes during the day come out at night. But, night snorkeling can be a bit of a drag because you get cold quickly, and you have to be carrying lamps which will only illuminate a small area for vision at once. If you go at dawn though, when it’s gotten light out but the sun isn’t shining directly on the water, some of those nocturnal critters are still out and about, and they’re much easier to observe. 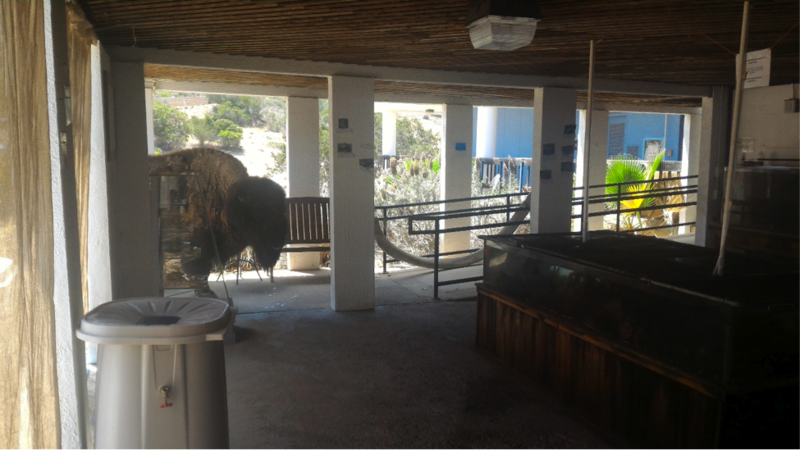 A friendly, but rather large and intimidating bison startles me in the touch tank room. Another worthwhile story concerns an old bison which started visiting the campus on a semi-regular basis. He seemed very relaxed, and posed for many photo ops. And although he wasn’t exactly a menace to our health, it was occasionally startling if he stuck his head into the touch tank area while I was in there. I managed to get a good picture of him while backed up against the wall and freaking out a little bit. 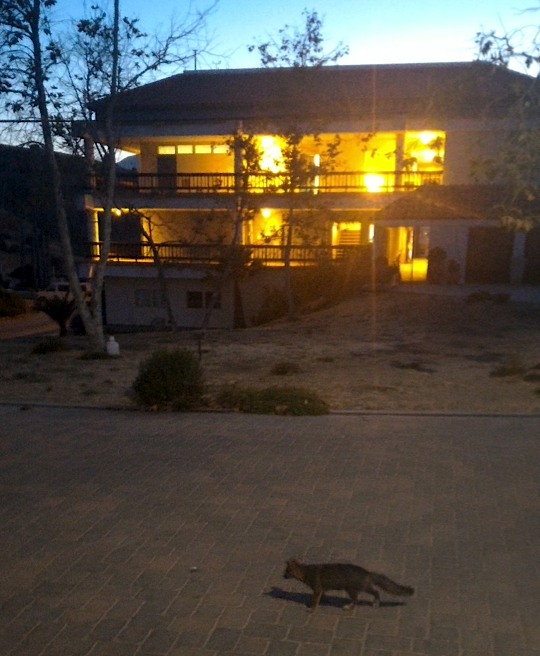 A Catalina fox visits while the setting sun shines through the lab’s breezeways. I could cover a lot more personal anecdotes, from watching foxes in the evenings to riding a mountain bike to various parts of the island, but it is worth commenting on my scientific progress this summer as well. I built on the methodology developed by Natali Tuttle, an REU on Catalina last summer, to measure bioavailable iron in the ocean’s surface. I used that methodology to track the changes in the form of iron in Big Fisherman’s Cove over daily cycles, getting some excellent data for that. And I developed techniques to let us do experiments which are sensitive to metal contamination at the Wrigley Institute, which will let us do a lot more research to investigate how microbes influence trace metals in the ocean. On the fourth of July, several of the graduate students and I took a boat down to Avalon to watch the fireworks. As my schoolwork starts to get busy this fall, the amount of time I spend at the Wrigley Institute will have to decrease, but I’ll be keeping an eye out for opportunities to get back there. 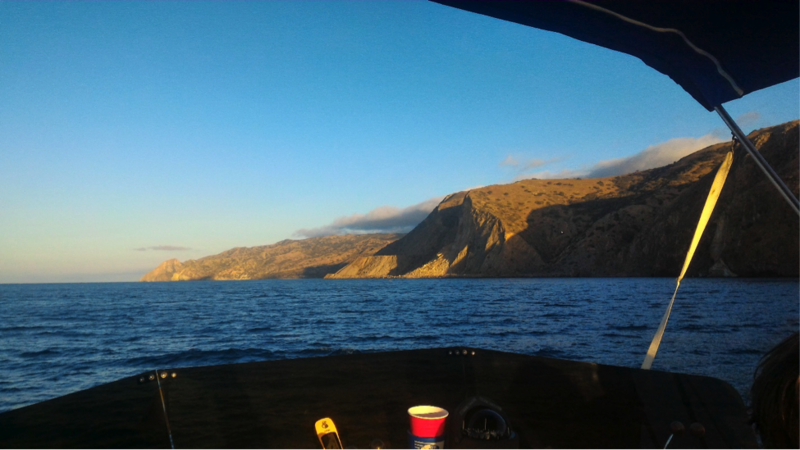 With research facilities that good right next to breathtaking pieces of natural beauty, Catalina is a really amazing place to work. Kenny is a USC Biological Sciences PhD student with the research group of Dr. Jim Moffett. His summer was spent studying ‘detection of ferrous iron in marine surface waters in the presence of photochemically generated interferences’. This entry was posted in Graduate, Wrigley Institute on September 1, 2016 by Jessica Dutton.